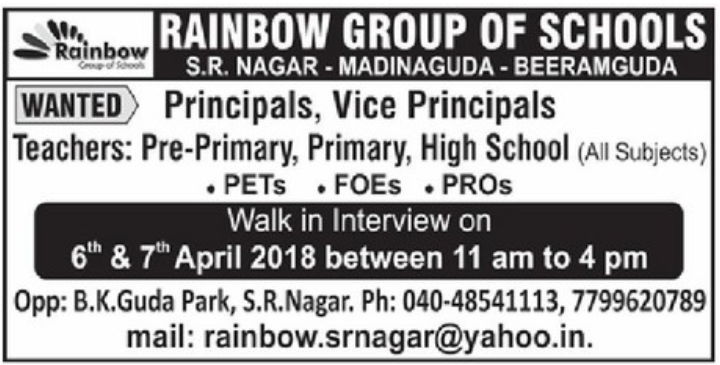 Rainbow Group of Schools,S.R.Nagar has advertised in Eenadu newspaper for recruitment of Teaching Faculty and Non Teaching Faculty job vacancies. Interested and eligible job aspirants are requested to walk-in at school campus. Check out further more details below. 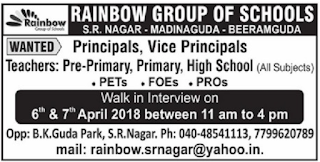 Name of the School: Rainbow Group of Schools, S.R.Nagar, Telangana. About School: The school uses a cross-curricular approach to teaching and learning. This means that skills, knowledge and understanding across a range of subjects are brought together and form a topic. Within the topic, children are able to practise and apply their reading, maths and English skills in other subject areas.